He got back to London on Saturday and had a headache and a fever. Tourists have to have innoculations against malaria and 3 or 4 other diseases but there is no antidote for dengue fever or a treatment. It has to work its way through the system and that is it. There is a serious strain called dengue hemororrgagic fever in 1% of cases. It is really worrying but I guess he is in good hands. Sorry to hear about your son - I had never heard of dengue fever before, just looked it up on the internet, apparently it is prevelant in about 110 countries, did not even know that mosquitoes transmitted anything else besides malaria. Hope he gets well soon! Hi GeeWhizz, I'm sure your son will be fine, but it is times like when you can't pop in to say hi that the world seems huge. All the best, hope he recovers soon. Oh dear, geewhizz. MrA and I hope it won't be too serious and that you son will be right as rain soon! Don't stress too much over the unknown as it may never happen! Blessings. Sending lots of love your way, geewhizz. Am thinking of you - I know how worried you must be so far away. How long does it take for dengue to work its way through? Perhaps he's over the worst by now? I really hope so. Let us know how he's doing. I do not want my telephone account at the end of the month after calling him on his cell to UK a few times a day. Hope Nico is feeling better and makes a full recovery. Hoping for the best Geewhizz. Really hope he recovers quickly Geewhizz! "Dengue haemorrhagic fever (fever, abdominal pain, vomiting, bleeding) is a ... complication, affecting mainly children." Thanks msplod. I have read a lot about it since they suspected dengue fever.A test takes weeks to complete but his symptoms all point to dengue fever and the fact that he came into contact with a number of mosquito's. He seems to be on the mend so hope all goes well but I will not stop worrying until he is well over this. Get welll wishes to your son Gee Whizz I am sure he shall recover.. It has been a very worrying but he seems to be on the mend. He is still in hospital but his temperature is down and all blood count tests are fine. Glad to hear the good news Geewhizz. Probably posted for my benefit. I took a screen shot.So he seems to be on the mend. Reading about this fever on internet is really scary.I feel quite depressed after all this. Am sure most internet sites exaggerate things and they gleefully describe the worst case scenarios that hardly ever occur - so don't feel depressed - the worst is over! Gee Whizz that is great news! Booksallsizes I never had the will power to go and look at any operation pics I had to have before. Booksallsizes I never had the will power to go and look at any operation pics I had to have before. Stats taken from internet. ---If you live in Thailand for 20 years and take no precausions against being bitten by a mosquito the likelyhood of being bitten by a dengue infected gogo and contracting dengue fever is 1 %. So my son was just unlucky.They decided to spend an extra week in Thailand and this was most likely the week he was infected by the mosquito. He is back home in London (Landed up in hospital in Dorset UK) and feeling better everyday. Poor thing. What amazes me is,if a mosquito can give us malaria or dengue fever how come it cant give us H.I.V. or aids. "What amazes me is,if a mosquito can give us malaria or dengue fever how come it cant give us H.I.V. or aids." It should actually, if you kill it over an open sore or scratch and the blood gets into the sore or scratch. But according to scientists they don't inject blood into you, but saliva which carries the malaria. As a parent, it is difficult, at best, when a child (age isn't a factor) is sick and we are able to be at his/her bedside. It is absolutely 'shake to the core' when he/she is ill and we are hundreds, if not thousands, of miles away. The gut-wrenching fear and wild imagination kicks in 'full gear' and we can make ourselves 'sick with worry'. 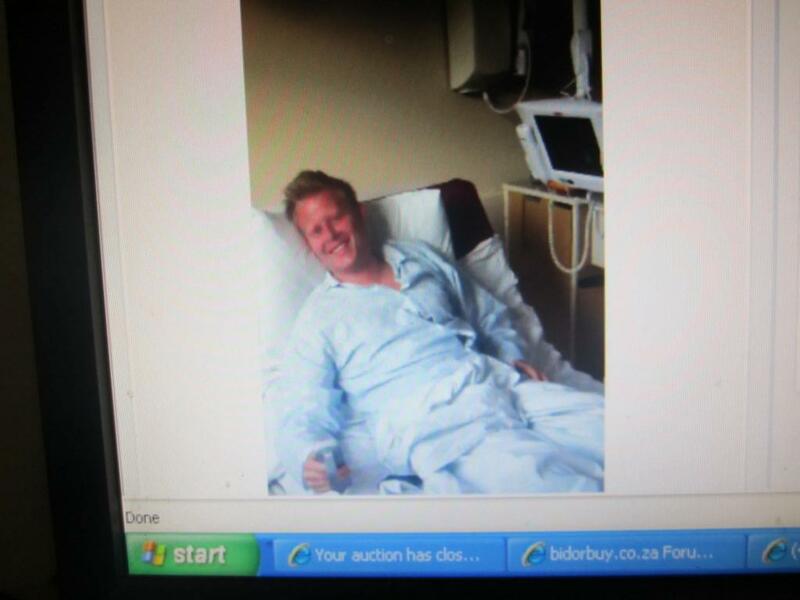 Thankfully, your 'youngun' is in good hands and is 'on the road to recovery'. Take care of you so that you don't end up trading places with him. Sending warm thoughts and wishes for a speedy recovery from this corner of the flat map. Thank you Ruthie. I very nearly got on a plane to UK but you know he has a wife and she was a star looking after him. I am now also a mother-in-law and tread carefully. My daughter-in-law sat through 3 nights with him in hospital when he was at his worst. I would proberly have been no good for him freaking out and putting him on his nerves. Thinking of you geewhizz and hope Jeremy is right as rain soon! Blessings.